Throughout the 1980s, Marvel's West Coast animation off-shoot MARVEL PRODUCTIONS was responsible for many familiar animated series (and several long-forgotten). The studio was previously DePatie-Freleng (of PINK PANTHER fame) and was acquired by Marvel in 1980 to spearhead their expansion into areas seen as being more 'future-proof' than the core comics business. Stan Lee, of course, departed Marvel's New York offices to relocate to California to become MP's creative director, chief pitch-man and sometime TV show narrator. 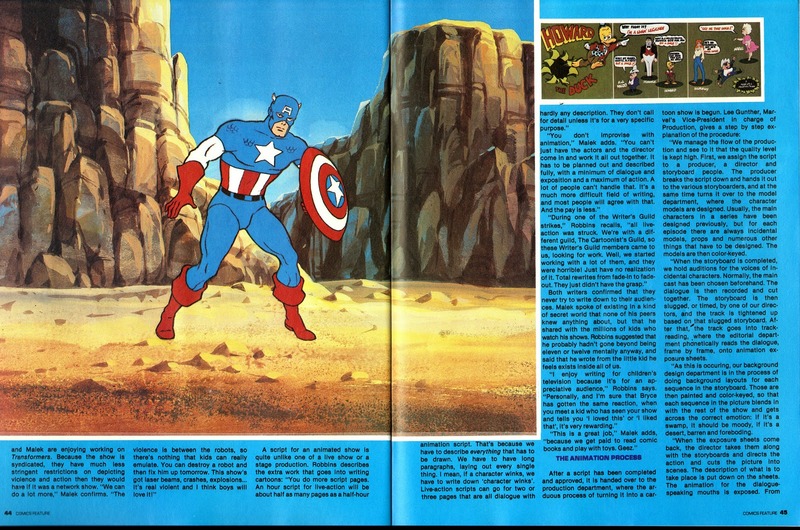 Principally created to exploit Marvel's own creations (the company's remit always included live-action film, TV and theatre but it never seemed to expand out of animation), it enjoyed its greatest success in partnership with Hasbro's marketing agency Sunbow as a producer of toy-based animation. 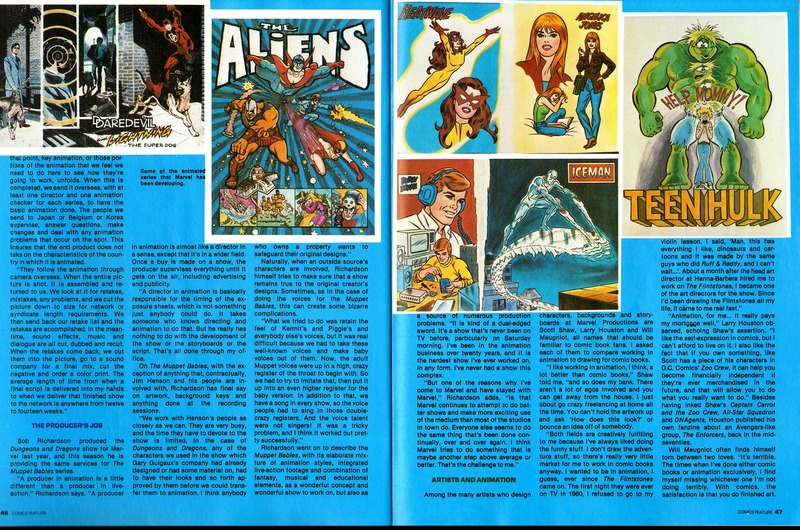 Former Editor-in-Chief Jim Shooter (dismissed from Marvel mid-decade. More on that from Slow Robot in future) has claimed in his excellent blog that Marvel Productions only appeared profitable because the accountants budgeted the shows on the assumption that Marvel would enjoy a regular revenue stream from reruns and, eventually, go into profit once the initial costs of making the shows was covered. But, according to Shooter, Marvel's deals were on a work-for-hire basis and the company had no profit participation. So, if Marvel didn't cover all its costs up-front (and Shooter claims they didn't), they had no further income to push them into profit. 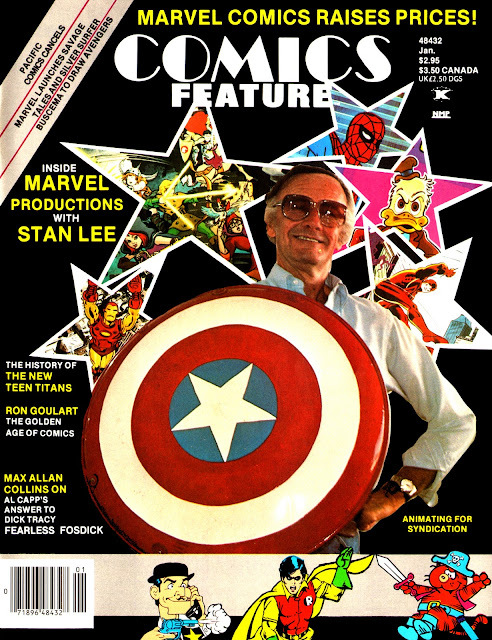 With no apologies for running a second Marvel-themed COMICS FEATURE article so soon, Slow Robot presents this excellent article from early 1985 (which would have been penned sometime in 1984). Some notes follow. 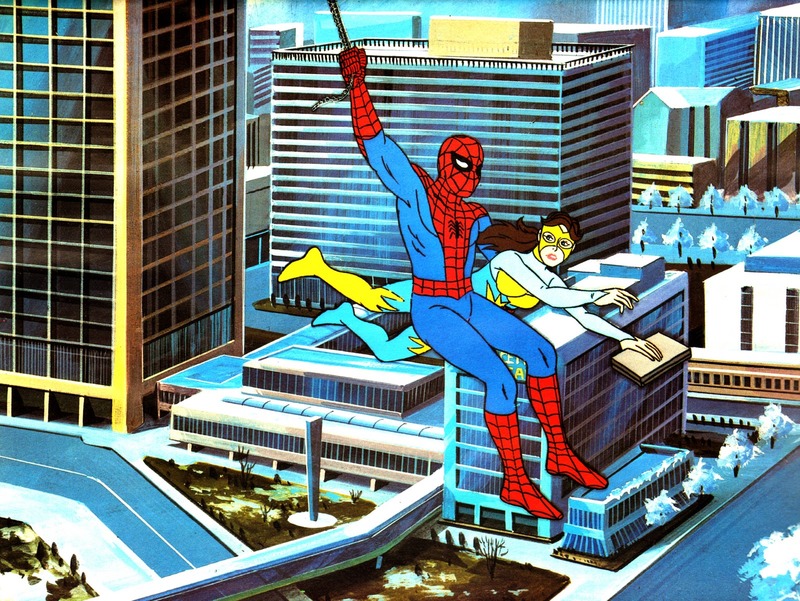 SPIDER FRIENDS (which sounds awfully like DC's rival, and more successful SUPER FRIENDS) was the working title for SPIDER-MAN AND HIS AMAZING FRIENDS. Heatwave, obviously, became Firestar. THE TRANSFORMERS. 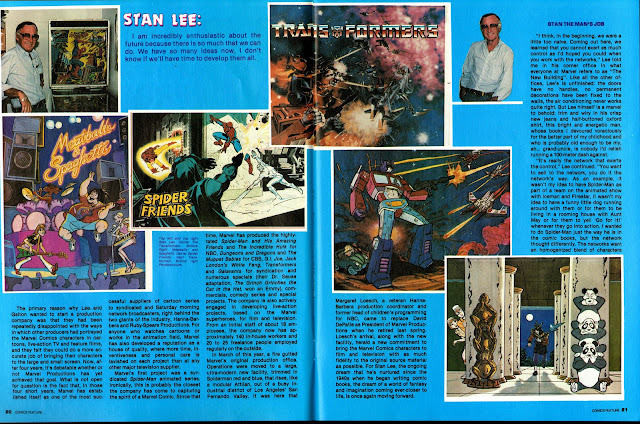 According to Jim Shooter's blog (here again), Marvel Productions had a very different plan for how to realise the Robots in Disguise. 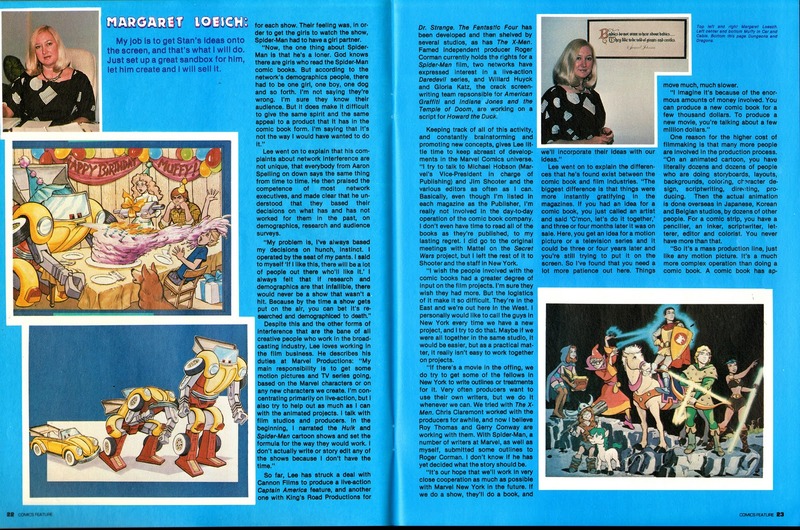 Hasbro opted to use the ideas concocted by the comics creatives across all media. The pitch artwork shown below the box artwork presumably reflected MP's thinking (with kids as 'pilots'). PANDOMONIUM appears to have never gone into production. MUFFY IN CAR AND CABLE. The Transformer-a-like Bumblebee-wannabe, which has something of the GOBOTS about it, never happened. DUNGEONS AND DRAGONS. 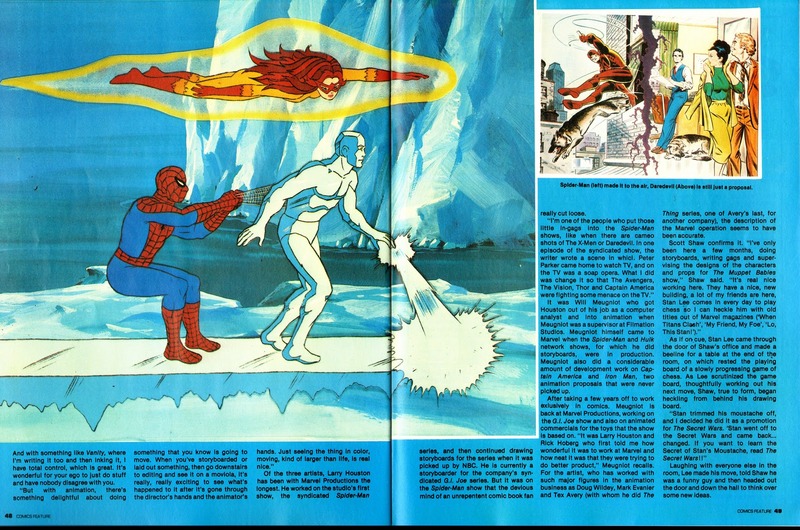 The artwork contains a few differences in design and colouring compared to the finished series, which ran on CBS and BBC ONE. And never had an official first or last episode. The pitch artwork for IRON MAN, ANT MAN and (new creations) THE MONSTRESS and THE ALIENS didn't sell. 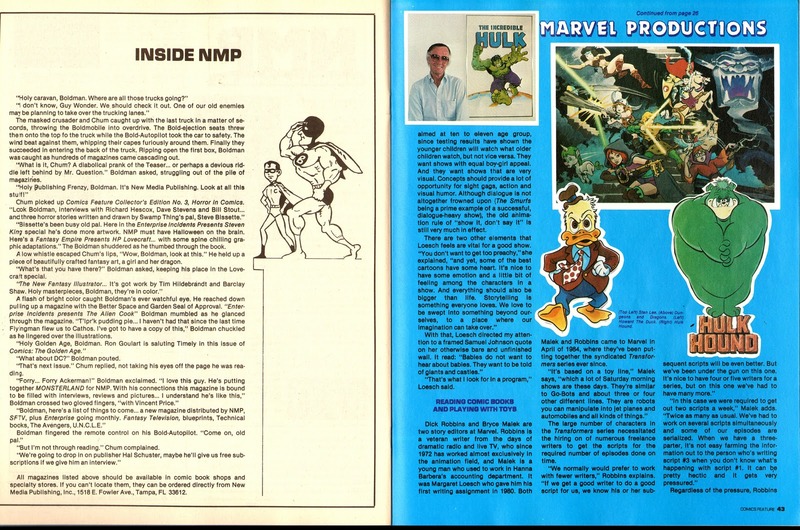 HOWARD THE DUCK never became an animated hero but did become an infamous George Lucas live-action mis-fire. HULK HOUND and TEEN HULK, unsurprisingly, went nowhere. DAREDEVIL AND LIGHTNING THE SUPERDOG did sell to ABC after Mark Evanier wrote a series bible and pilot script. But according to his account, an executive at Marvel Productions pissed-off someone at ABC and the project was swiftly dumped. 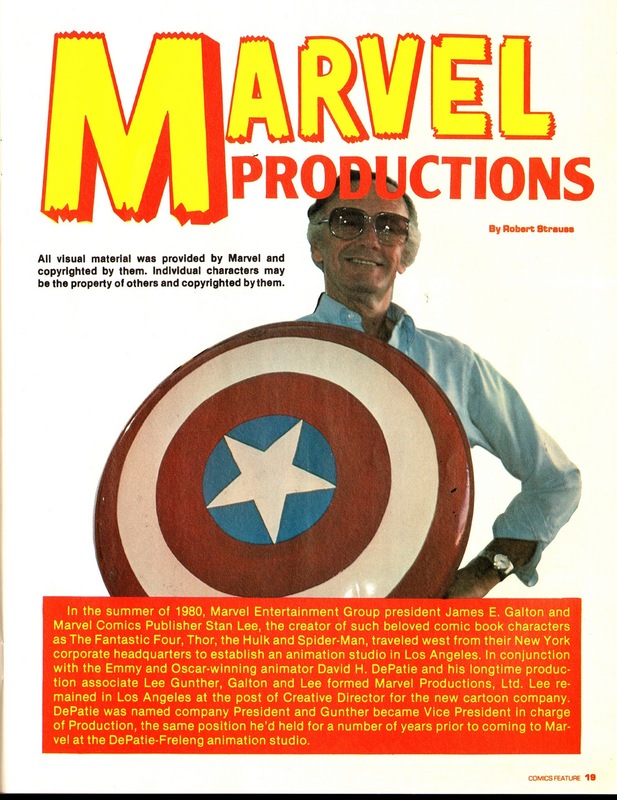 And, finally, here is the memorable MARVEL PRODUCTIONS logo that appeared (unless the BBC faded it too soon or cut it off) at the end of their shows after Marvel were acquired by New World Entertainment in 1985. It contains similar design elements to New World's own logo. Wow that's pretty awesome. I've always wondered about the inner workings of Marvel Productions and I've never seen that art with a driver inside Optimus Prime's robot mode. I do remember watching Pandemonium about the three pandas that combined into one big panda. If I remember correctly it aired back to back with Meatballs and Spaghetti. 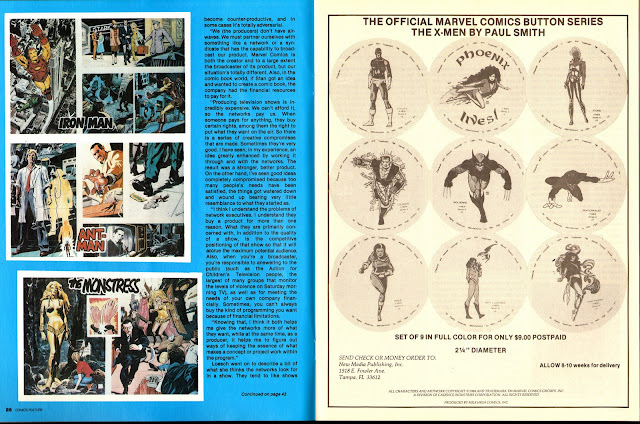 I'm sure if you search online for old 80s cartoon seasonal lineup ads you'll find promos for it that ran in old comic books. 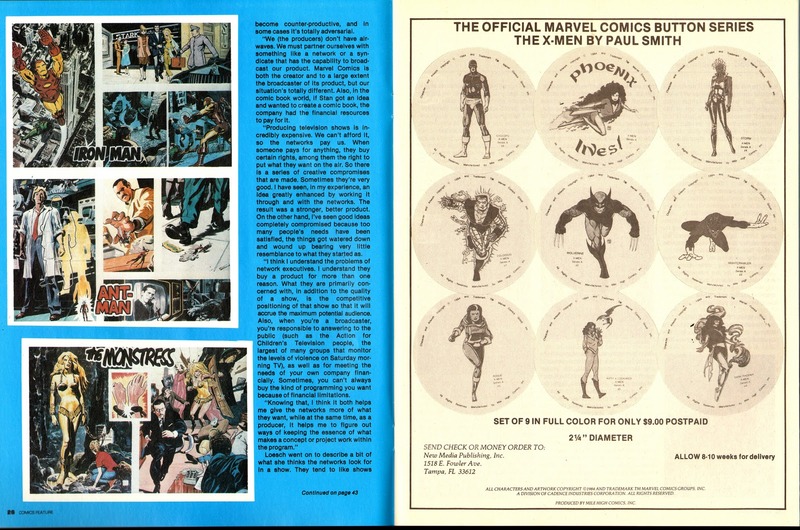 I noticed pages 24 and 25 from the magazine are missing. Do you have those scanned as well? MEATBALL AND SPAGHETTI really did exist although it appears to have never run in the UK. Strangely Germany apparently got it as there is an episode on YouTube dubbed in German. Both shows first aired in the US on the CBS-TV Network during it's 1982-83 season. I liked that movie! I suppose though I was too young and naive to know better. I could tell they would not have been any better. These things happen, MarK Evanier had quite a lot to say about his career over the years writing for all sorts of places. You can listen to some of his best times over at this radio program (episodes cost a buck). I've read someplace the animation in this sequence was handled by Chris Bailey, whom some may remember for his later Disney series "Kim Possible". New World owned quite a lot by the end of the 80's including TV stations (one I recall was WJBK, a former CBS affiliate in Detroit later bought by Fox). Oh you'll love this, from a trade publication advertising that came out in 1987!